With more than 30 feature enhancements to key modules including Library Master, Paperless Office, Inventory Management, and Custom Office, 2019.0 is our biggest release for Sage 100 and Sage 100cloud in years. Motivated by a clear vision focused on intentionality, simplicity, and user-centeredness, the 2019.0 release of Sage 100cloud is designed to optimize efficiency, improve adoption, increase customizability, and enhanced security. Sage 100cloud exists to help medium-sized companies automate their business processes so they can spend more time on activities that generate value. Automation not only means that tasks can be completed more quickly, but it means that they can be completed with more consistency and precision as well. In other words, Sage 100cloud is designed to help businesses do more with less risk. Our 2019.0 release includes many additions to an already rich set of automation tools. The new auto-complete feature for General Ledger account numbers, for example, will be a real time saver during data entry, while also ensuring that account numbers are entered correctly the first time. A new copy button added to the User Lookup Wizard means that a custom lookup for one user or company can be easily applied to others without having to generate the same query multiple times from scratch. We are also increasing efficiency by making sure that users have the information they need, when and how they need it. From the General Ledger, users can now consolidate all General Journal entries into a single PDF. The account number and description are now printed on every page of the General Ledger Detail Report and General Ledger by Source Report. We have also delivered several highly requested printing features for Inventory Management. Users now have the option to include or exclude inactive items from the worksheet, Physical Count Entry, and Variance Register. 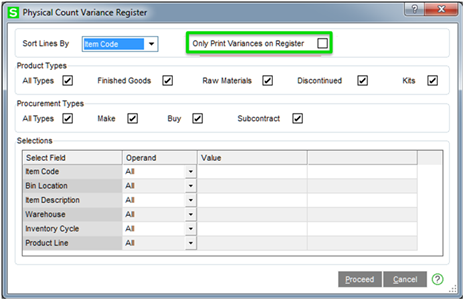 More than this, we have added an ‘Only Print Variances on Register’ checkbox. If you select this check box, all items for which there is no variance are omitted from the register. At Sage, we understand that a business management solution is a tool and, as a tool, it is only as effective as the organizations that wield it. To assist our customers in their awareness and high impact use of Sage 100cloud’s many features, we have added ‘grad cap’ links that direct users to relevant training through Sage University. With version 2019.0, we have included 20 additional Sage University links covering areas including Accounts Payable, Accounts Receivable, Bank Reconciliation, General Ledger, Job Cost, and Library Master. Custom Office is one of the biggest reasons that businesses choose Sage 100cloud. The ability to easily customize (not just configure) data fields, forms, and the user experience in ways that persistent across upgrades means that customers can save thousands of dollars that they would otherwise have to pay to customize other platforms (if those platforms are customizable at all). 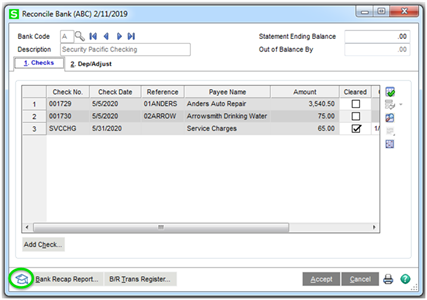 With the 2019.0 release of Sage 100 and Sage 100cloud, it becomes possible to customize the columns and buttons on the Journal & Register Viewer, Period End Report Viewer, and Report Viewer. 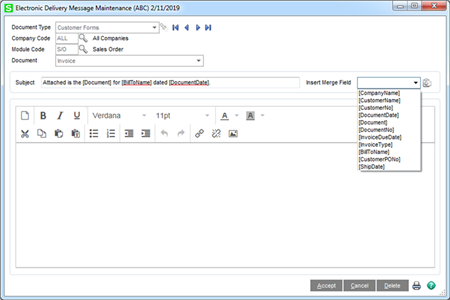 We have also added support for HTML email in Paperless Office, thanks to a new message editor in Electronic Delivery Message Maintenance. With this, we have increased the size of the message field, added several new merge fields, and included Cc and Bcc options for E-Mail Addresses. Numerous other enhancements have been added to Paperless Office in the 2019.0 release, including the ability to add additional attachments, pdf file name options, and an option to copy salespeople on email. Security and compliance are top priorities in everything we do. In addition to encrypting bank information and supporting TLS 1.2 when sending emails through Paperless Office and eBusiness Manager, we have added more tracking and flexibility to the Activity Log. Changes made in Role Maintenance and User Maintenance are now tracked, and a new ‘Security’ activity type has been added. We have improved performance by allowing users to apply a threshold in the maximum number of records to display, and we have added a purge utility that allows businesses to maintain the Activity Log through either deletion or the creation of an archive file. Proven. Flexible. Connected. Sage 100cloud is your business management solution. For more details on the features of Sage 100 2019, you may click here.